I was so excited to get my hands on A Brief History of Seven Killings. It is set in Kingston, a city I loved while I was in it and have greatly idealised since leaving. In fact, much of it is set in "my" neighbourhood - I can feel the heat, smell the piss and flowers, see "the Singer's" house (just two blocks from my old apartment) and hear the non-stop honking of the non-stop traffic. Half-Way Tree and Camp Road and Hope Road and the causeway to Port Royal are all a part of my happy memories of Kingston. Given all of that, and my reader-crush on Marlon James, and my former obsession with Booker Prize winners (since the rule changes I've lost interest), one could assume that my excitement was high - and as I've already said, it was. 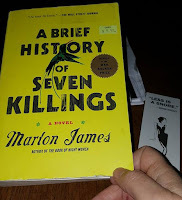 Marlon James' writing is the kind you deep dive into and it swallows you whole in a humid, multi-sensory atmosphere, not unlike Kingston itself. I have devoured approximately 2/3 of the book in large bites. It has been a solace to again be surrounded in the poetry of patwa (spelling chiefs, don't correct that - Jamaican patois is patwa), and to be transported to the sweet memories of time and place. Yet, I'm not sure that I can finish this book. 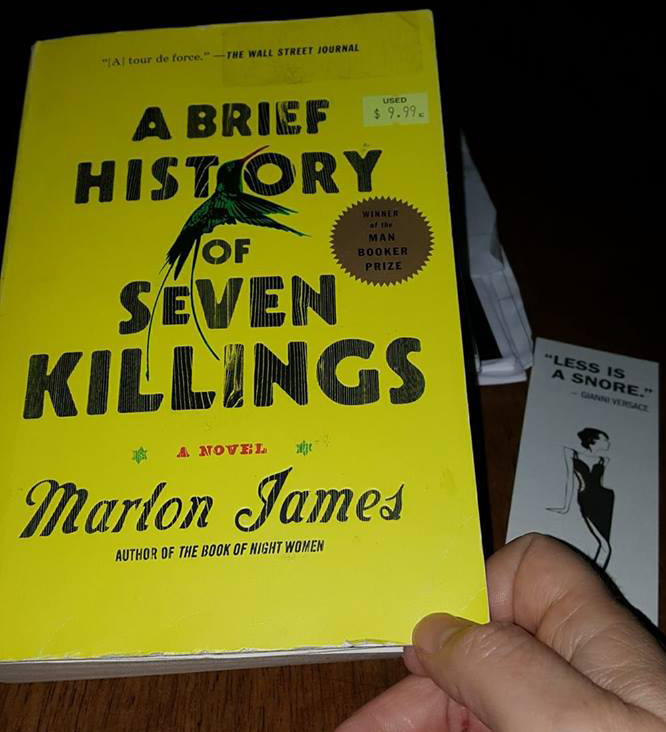 There are two problems: a 704 page "brief" recounting of seven actual (novelized and speculative, but entrenched in fact) killings set in the most violent era of post-slavery Jamaica's history is in fact overwhelmingly vicious. As I've mention just recently, my brain - in particular my dreamscape - is easily influenced by what I read and watch, and it's important to the maintenance of my mental health that I not toss and turn and dream of hanged men and corrupt police and the most imaginative forms of violence and torture, particularly when I know that much of this is not James' imagination but how life was in Kingston at the time (and still is for some). That's the most pressing issue. The second problem I'm finding is that there is not a single character in this book, 400+ pages in, that I care about. I love a velvet-rich atmosphere, a compelling story, and - always - brilliant word play. I like the changing points of view in the novel, and the disruption of the simplest good versus evil narrative. But I just don't care about any of these people. I need someone to like. It's not sad for me when these characters are killed off, and it should be. I want to feel that loss. It shouldn't be that the most interesting part of a story for me is looking for things I can recognize and remember. I suppose I'll probably finish the book. I just wanted to share my thoughts in the meantime. I spent several happy hours this week completing a charming puzzle Shiney sent me. Sending each other puzzles has become our 'thing' in the last few years, although the backstory is best told offline and in forgiving company. The spark wasn't our most politically correct moment, but now ... sending puzzles is our thing. I don't actually remember Shiney and I doing puzzles together when we were little neighbour girls. I had a Pink Panther puzzle that I loved and did over and over again (oh, the adult luxury of the one-off puzzle! ), and I imagine we must have done it together at some point, but I don't have any specific memory of it. No, 40 years ago reading horse stories and then Hardy Boy mysteries on our long school bus ride was more our thing, along with sneaking around in the forest that surrounded our homes and traipsing after her big brother and his friend. I may, in fact, have squealed this summer to find a jigsaw puzzle comprised of Hardy Boy mysteries covers - it was the perfect golden thread between then and now. 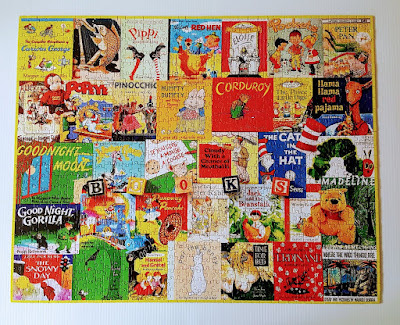 Of course I had to send it to Shiney, and she, in return, sent me this puzzle of children's book covers. 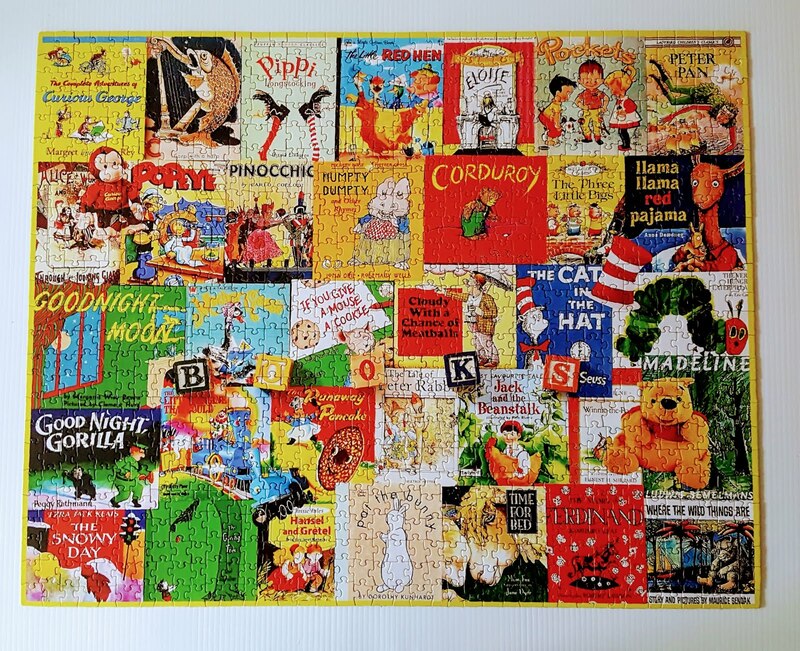 As I was piecing this puzzle this week I was at first charmed to see all my favourite friends, particularly beloved Winnie-the-Pooh. Free-spirited Pippi Longstocking is there as well, reminding me of the year I dressed as her for Halloween and the way those fake, red, sticking-out braids built on a wire coat hanger dug into my head. Sweet, gentle Ferdinand smelling the flowers in his field no matter how much people wanted him to be ferocious always seemed a friend, and now reminds me of a certain son of mine. And there's Madeline - the littlest of all - in her confusing and rhyming French context, and always naughty Peter Rabbit who fed my love of lagomorphs. There are several books here I've never heard of, and I few I'm familiar with but have no emotional connection to, but I was surprised to see how many I remember with a bit of a cringe. It's no secret that I was prone to nightmares as a child. In fact, I still am. The only reason I started watching Game of Thrones on TV in 2011 was that I had a giant squishy protector to keep me safe in the dark. Otherwise, I don't watch fantasy, horror, or thriller TV or movies. I've mostly equated it to having too vivid an imagination combined with a belief in both a just and loving God and evil supernatural powers. What's odd, though, as I remember being super creeped out by something as ludicrous as the Run-Away Pancake (mind you, don't come between me and brunch) or finding something sinister about the Cat in the Hat, is trying to figure out why I would have been such an easily frightened child. My parents were both present and loving. I shared a room with generally tolerant Freckles, and while she wouldn't have consoled me much of the time at least I wasn't alone. We had a secure home, lots of friends, and loving connections with our extended family. Parental Guidance was an actual approach to parenting, not just a movie rating. I had a fairly simple and genuinely happy childhood. And yet I had recurrent terrors in the night that sometimes left me unable to go to school the next day, and I dreaded the sounds of cars on the gravel road in our housing compound because I knew they would cast lights upon the wall that I knew weren't ghosts yet would inevitably interpret as such. Things that were supposed to be a treat - like watching the Wizard of Oz in our school library - sent me crying from the room and hiding under a desk until my mom could come to town to pick me up. Aside from the nightmares, which I mostly know how to avoid, I don't consider myself a fearful adult. I do have a bat phobia, but since I don't live in bat-infested territory I rarely have to confront that. I genuinely love adventure, seeing new places, and trying new things. And I like people - I am equally comfortable at a cocktail party with the Premier or talking to a room full of people experiencing homelessness. I have no problem wandering in the city or in nature on my own, and Jamaica taught me that I like jumping from (relative) heights into water. There's a kind of fear/anticipation that I really enjoy. So why did I spend so much of my childhood quivering? Honestly, maybe I didn't. Maybe it only seems like that because I'm focused on those memories right now, instead of on 4x4ing in the foothills of the Rockies, and learning to shoot a gun, and tubing in frigid river waters, and exploring our wild "neighbourhood." And maybe fear of physical things is less real for me than psychological fear. I don't have any deep insights, it was just something that occupied my thoughts this quiet week as I meditated on the puzzle shapes.